Posted February 9, 2013 by laurielmorrison & filed under Book Reviews, Teaching, Young Adult Literature. I love it when I discover an author a little late in the game, after he or she already has multiple novels out, so that I can finish one and pick up another without having to wait too long. A couple of years ago, I fell in love with Jaclyn Moriarty’s Ashbury High novels, and I read Feeling Sorry for Celia, The Year of Secret Assignments, The Murder of Bindy Mackenzie, and The Ghosts of Ashbury High within a couple of months (it would have been less than a couple of months, except I had to request many of them from other branches of the public library and wait for them to arrive). All of these Ashbury High novels use an epistolary format: they include actual letters, imagined letters, transcripts from hearings and meetings, diary entries, emails, blog posts, exam essays, and more. The format is creative and engaging, and, as a teacher, I appreciate that it puts readers into an active role. Readers must sift through the materials we are given and decide which narrators and materials are reliable and how the pieces fit together. It was fun to read these books in a short time frame because I knew what I was getting from each one—zany humor, big plot twists, and extremely endearing characters—and yet each one was different enough to surprise me (especially The Murder of Bindy Mackenzie, which has a jarring shift toward the end, and The Ghosts of Ashbury High, which features time travel and, as the title suggests, ghosts). Last year, I ended up finding three of the four Ashbury High books at a used bookstore and purchasing them for my classroom library because I thought some eighth and maybe seventh grade readers might enjoy them. I wouldn’t have thought they’d appeal to sixth graders, and I almost didn’t buy Bindy Mackenzie because it was a little pricey for a used book and I couldn’t decide if middle schoolers would “get” it. (Silly me.) But this year, to my delight, a few sixth grade girls have excitedly read Bindy MacKenzie and The Year of Secret Assignments. One even told me we should do a pen pal program, like the Ashbury High students do. As with Jaclyn Moriarty’s novels, I know what I’m getting when I start an A.S. King novel: a smart, funny first-person protagonist who is dealing with some very tough circumstances; complex and flawed adult and teenage characters; and surreal elements. I’ll admit that I don’t always know what to make of the surreal elements. In Ask the Passengers, the main character Astrid is struggling to figure out what it means that she is maybe/probably in love with a girl. She is neglected by her parents; disappointed by her best friend; and fascinated with philosophers, especially Socrates. She imagines Socrates appearing in her day-to-day life, and she sends her love up to people in airplanes, because she feels like nobody needs her love at home. King includes vignettes from the perspectives of people in the airplanes; these vignettes could be scenes Astrid simply imagines, but King suggests that the people in the airplanes might actually feel Astrid’s love and be impacted by it. In Please Ignore Vera Dietz, meanwhile, Vera is coping with the death of her ex-best-friend, Charlie, and coming to grips with the secret of what happened the night he died. King interrupts Vera’s narrative with chapters that feature “brief words” from Vera’s dad, Charlie, and even the pagoda in her town. Even though he is dead, Charlie is able to communicate with Vera through her dreams, and to force her and other people to do things. And in Everybody Sees the Ants, Lucky Linderman is brutally bullied during the day, but in his dreams at night he visits his grandfather, a missing prisoner of war, in the jungles of Vietnam. King suggests that Lucky’s dreams may in fact be real (or Lucky may be unreliable and possibly not quite sane, because he believes they are real; detaches from his traumas; and sees ants, who wear party hats and provide commentary). The paperback version of Everybody Sees the Ants includes a Q and A between A.S. King and fellow author Paolo Bacigalupi at the end, and Bacigalupi notes, “You ride a lot of surreal edges where, as a reader, I found myself questioning whether Lucky had a grip on his sanity or whether he was completely off his rocker. That strikes me as rich but also treacherous ground. The safe choice would have been to make this a completely ‘realistic’ novel.” “Realistic fiction that rides surreal edges” seems to me the perfect description of King’s style, in Everybody Sees the Ants as well as in Please Excuse Vera Dietz and Ask the Passengers. It’s a much more precise and fitting label than “magical realism” (but, a little unwieldy for, say, a section of books in a bookstore or something). I also agree with Bacigalupi that King’s novels tread “rich but treacherous ground.” Her unusual choices are thought-provoking and would lead to fascinating book-group or class discussions (and the educators’ guides on her websites include excellent questions I’d love to talk about with a group of students), but they also might alienate or frustrate some readers. King’s books are a little mature in content and language to use in a middle school curriculum—on her website, King explains that most of her books are for ages 14 or 15 or up because of the content. I’m not sure about assigning one in class, but I’m sure some of my students would be ready to read and discuss them, and I think young people are remarkably good at choosing books they’re ready for and focusing on the parts that resonate without worrying too much about the parts that don’t. I’ve recommended Everybody Sees the Ants to my eighth grade students, and now I’ll try to get copies of all three novels for my classroom library and then sit back and be surprised by who gravitates to them. How about you? Anybody else indulge in any book binges lately? Book binges are the best! I haven’t had much reading time, but it’s always awesome to discover an author after there are several books you can already read. I have an annoying habit of doing things like getting involved in a series before it’s complete (like oh, I just breezed through The Hunger Games and Catching Fire in 15 minutes and WHAT DO YOU MEAN I HAVE TO WAIT FOR THE LAST ONE AND IT DOESN’T EVEN HAVE A TITLE YET?????????). I haven’t read either of these two authors, so they’ll go right on my list :). I tend to do the same. I always like it when I find out I love an author’s work and there are a bunch more books they have out that I wasn’t aware of. I like your blog! Laurie, thanks for this post. I read Moriarty’s THE YEAR OF SECRET ASSIGNMENTS and enjoyed it very much. And of course you know I like A.S. King. I also love to dive into an author when I find that I really love him or her. Lately, though I’m reading across genres. 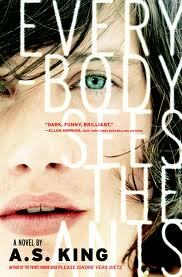 As soon as I finish one of the books I’m reading, I look forward to diving into EVERYBODY SEES THE ANTS.